...As interest groups jostle for appointments President John Agyekum Kufuor must be having sleepless nights these past few days as he tries to satisfy both interest and ethnic groups with the appointment of ministers. As at last Friday the president had two lists of contenders to deal with-those he has satisfied and those he has disappointed. Word is even going round that some of those whose names have yet to appear on the roster have resigned to accepting any jobs, including board members or chairmanship of state enterprises. Public Agenda can report that at press time on Friday, tension was mounting among some interest groups as they held crucial meetings to map out strategies to catch the eyes and ears of the president. Some even went on air to vent their spleen on the president and his advisors. Notably among the these groups is the Central Regional Parliamentary Caucus, which met last Thursday to deliberate on how to ask for their pound of flesh from President Kufuor. Keen to ensure regional and ethnic balance in the cabinet the president probably glossed over the region that gave him and the New Patriotic Party unwavering support. Honourable Kennedy Agyapong, Member of Parliament for Assin North said on Peace FM that contrary to some press reports that the Central Regional caucus was demanding the replacement of Central Regional Minister, Isaac Edumadze, they were rather asking for more cabinet appointments. As the list of cabinet positions stand now, the 'Florida' region has only one cabinet nominee, Professor Dominic Fobih, MP for Assin South. Some reports had it that even the nomination of Christine Churcher, MP for Cape Coast as Minister of Environment and Science was an after thought by President Kufuor and his advisors. The NPP's Women's Caucus in parliament has been on a 'cold war' path. Public Agenda can report that since the nominations started, they have met once to brainstorm on how to make their voice heard. Some gender activists have also joined the fray, calling for a fair deal for women. Women are demanding fair representation in the cabinet, which since 1992 has been dominated by men. The current equation of women in the cabinet stands at two cabinet ministers (Gladys Asmah and Hajia Alima Mahama), that is 11 percent against 17 males (89 percent). The parliamentary equation is neither favourable to women. Out of 230 MPs, women have only 25 (11 percent), while men are firmly in control of the remaining 105 seats (89 percent). With almost all the substantive posts given away women may have to take consolation with more deputy ministerial jobs. Though there's been a slight improvement from 19 female MPs in 2000 to 25 in 2004, in relative terms women have not made significant gains in their bid to have more representation in parliament, considering an increase in the total number of MPs from 200 to 230. In 1992 there were 4 female MPs, in 1996 there were 16 female MPs and in 2000 there were 19. A breakdown of the 19-member cabinet has the Eastern Region dominating with four members -(Yaw Osafo-Maafo, Nana Akufo Addo, Dan Botwe, Hackmamn Owusu Agyeman and Felex Owusu Agyapong), the Ashanti Region has three -(Kwadwo Baah-Wiredu, Dr. Kwame Addo Kufuor and Alan Kyerematen), while Greater Accra also has three- (Ayikoi Otoo, Prof. Mike Ocquaye and Jake Obetsebi Lamptey). The rest are Western Region two- (Paapa Owusu Ankomah, Gladys Asmah), Northern Region- (Charles Bintim and Hajia Alima Mahama), Cemtral Region (Prof. Dominic Fobih), Volta Region- (Courage Quashigah), Brong Ahafo Region- (Ernest Debrah and Upper East Region- (Joseph Kofi Adda). Clearly missing on the list of cabinet appointees is the Upper West Region, a region where the NPP and President Kufour lost miserably in 1996 and 2000. That explains why the Upper West Parliamentary Caucus last week loudly reminded the president not to deny the region a cabinet minister. 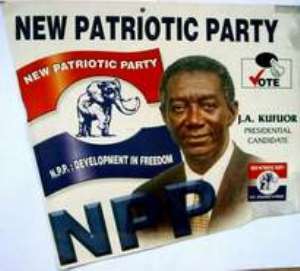 The stance of Upper West MPs was a replay of what happened in 2000 when after recording one of NPP's worse performances in the region, President Kufuor was at pains naming a cabinet minister from that region. It took intense lobbying to convince the president to change his mind and name Professor Kassim Kasanga as a minister. This time round, it seems he has decided not to back down from his decision. As the turns and the twists continue, it looks like the final list of the ministers and their deputies could take longer than expected.